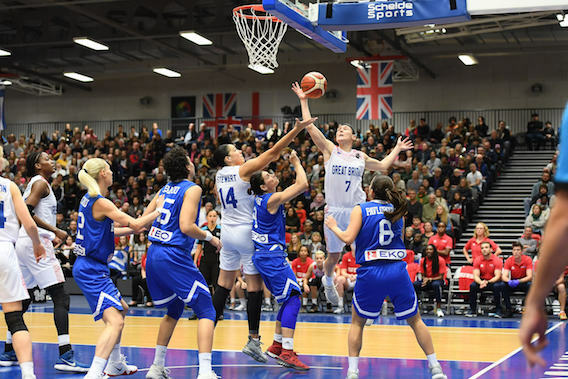 Great Britain are one win from qualifying for EuroBasket Women after a 79-77 defeat of Greece. 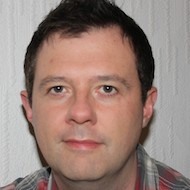 But, led by 21 points from Jo Leedham, they came so close to guaranteeing their berth in Manchester on Saturday. Victory by three would have assured a spot in Serbia-Latvia next summer. In a late dramatic twist, the Greeks grabbed a lifeline with three late conversions from the foul line to level the head-to-head tie-breaker between the teams. Nevertheless, Chema Buceta’s side will qualify for the finals as group winners with a win over Portugal on Wednesday back at Belle Vue. It looked as if it could be a rout for the home team but it was the proverbial game of two halves. The Greeks, winners by two in the initial group meeting between these two, hit early but GB’s response was potent. A 15-3 run gave the hosts a 16-8 lead at the end of the opening period, their defence rattling Greece’s shooters. 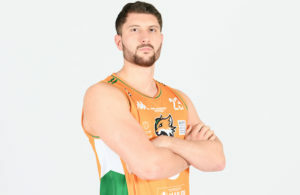 And with Buceta’s charges 6-for-14 from three-point range in the first half, the interior distraction of Temi Fagbenle, who landed ten rebounds despite scoring just four points, carved open perimeter opportunities. Quickest to capitalise were Georgia Jones and Karlie Samuelson whose twin threats allowed the home cushion to peak at 37-21 before Rachael Vanderwal darted unseen for a lay-up as time expired to give her side a 39-25 half-time lead. 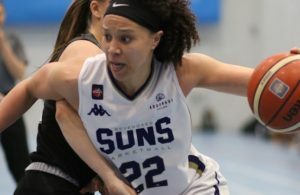 But the visitors, fighting for their own qualification lives, opened the third quarter with a 9-2 run that provided ample hope and although a pair of free throws from Leedham nudged GB 58-47 in front, six unanswered points scythed the advantage to a single point at the outset of the fourth. 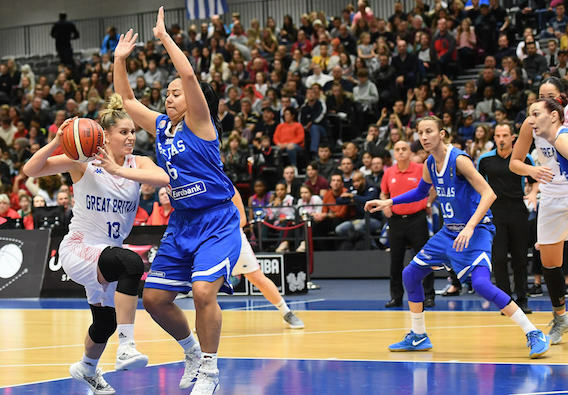 Styliani Kaltsidou, scoring a team-high 21 points in the penultimate appearance of her international career, was causing one problem after another with Samuelson’s fourth foul hampering her cause. Applying extreme pressure, Anna Spyridopoulou levelled with a three-pointer at 71-71 with 2:45 left but speedily Jones matched her efforts. Spyridopoulou struck again. Deadlock once more. Tension increased. This time, Samuelson – who added 14 points – was the long-range sniper that pushed GB into a precious 77-74 lead. However with 17 seconds left, the LA Sparks guard stepped out of bounds, giving Konstantinos Keramidas an opportunity to call a time out. Perhaps, one last throw of the dice. Instead, Leedham, as so often, delivered a huge intervention, stealing the inbound after a foul at mid-court and converting on the break. 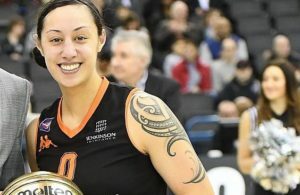 But she fouled Evanthia Maltsi on a desperate three-point attempt with 4.5 seconds left with the Greek captain draining all three pressure attempts from the foul line. And GB were unable to obtain one final shot, leaving themselves in a fine position but not yet quite secure. Buceta told the BBC: “I think that was a big step towards qualifying. One more point and we would already be there, of course, but at the beginning of the window we would have signed up to the chance of qualifying by beating Portugal in the last game. “Maybe we thought it was easy in the first half when were were leading by 14 points, but Greece came back because they are a very good team. Jones added 16 points off the bench on 6-8 shooting with GB 13-25 from three-point range. Elsewhere in Group D, Portugal upset Israel 75-72, with the Israelis now needing to beat to the Greeks on Wednesday to stand any slim chance of snatching one of the six best runners-up berths. An Israel win would send GB to EuroBasket, even if Portugal beat the odds and land a victory in Manchester. A Greek win, combined with a Portugal victory, would leave GB in second place due to overall points differential. Elsewhere, Russia, Turkey, Czech Republic, Spain and Slovenia all booked their tickets to Eurobasket Women 2019. Notes: GB starters: Vanderwal, Samuelson, Leedham, Fagbenle and Stewart, who won her 100th cap. Allen, Bravo-Harriott, Emmanuel-Carr, Campbell were the four omitted from the original squad of 16.